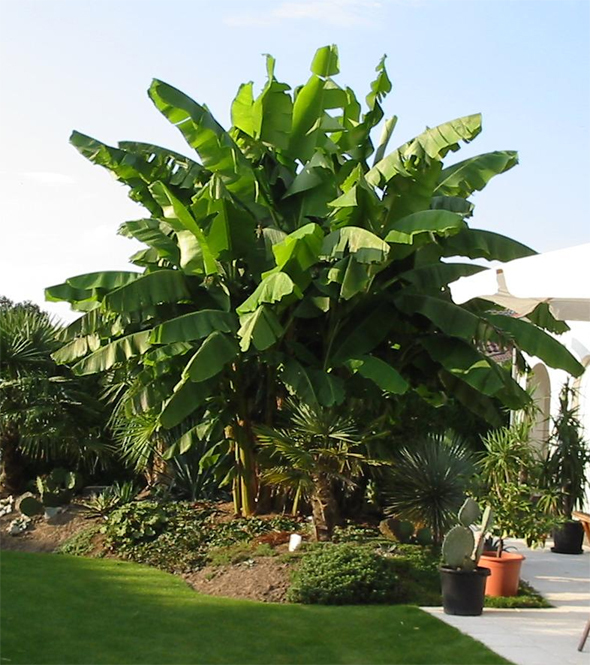 Banana plants are gaining popularity. Understandably, because this vast group of tropical plants gives an exotic look to your garden or living room. This article discusses the basic aspects of general care. Two names for the same plant. Or actually not entirely. Hobbyists would say “Musa” when talking about a “banana”, which is the scientific name. But actually the group is bigger. The Ensete, Musella, Canna, Strelitzia (paradise bird flower) and Ravenala belong also to this family. This article’s advice generally applies to all these species. Before we discuss care, it is useful to know a little more about the anatomy of a banana plant. 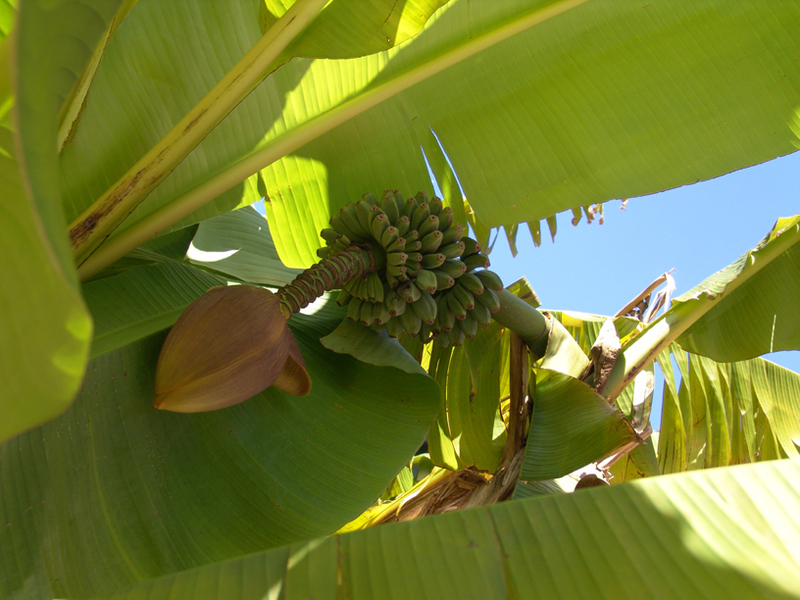 Banana plants have pseudo-stems from which every new leaf is pushed up from the center. 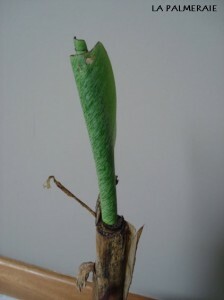 This new leaf unfolds only completely when the entire leaf has emerged from the pseudo-stem. In most species, the leaf is thin enough to be damaged by the wind, causing older leaves to be often torn apart. Furthermore, bananas form rhizomes. From these rhizoems new pups are formed which will show up at the foot of the “mother plant”. These pups can be cut off nicely to be planted separately. When the mother plant is cut to the ground, one of these pups will take over. There are so called sword pups and water pups. A sword pup is initially narrower, more pointed and grows faster and will eventually bear more fruit. A water pup has the typical wide banana leaves right from the beginning. This type of pup is a weaker plant, grows slower than the sword pup, develops roots less quickly, and therefore remains dependent on the mother plant. For this reason, water pups are usually removed in professional plantations. Most asked question is whether or not bananas will be effectively formed. In many cases, the answer is “yes”. Indeed, some species even form edible bananas. Of course, a flower must first be formed. A banana usually only flowers after 3 to 4 years. So you will need to keep it for that long successfully especially during wintertime. 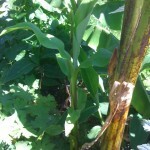 For this we refer to our article on the winter protection of banana plants. A banana plant especially needs a lot of light. A dark corner in the living room usually leads to disappointments. It is best to put the plant near a window or outside on the terrace. Avoid direct sunlight because the leaves can burn. 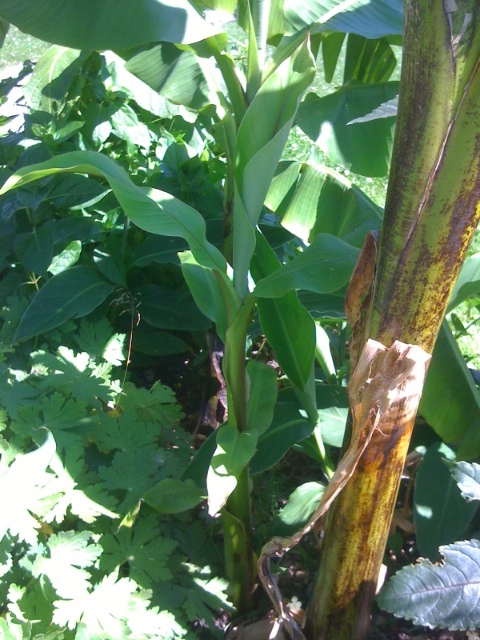 If you want to place the plant in the full sun, the banana plant will have to get used to the sun slowly. To do this, you will slowly increase the amount of hours with direct sunshine. New leaves formed in direct sunlight do not have sunburn problems. In addition to light, the banana also needs a lot of heat for optimal growth. 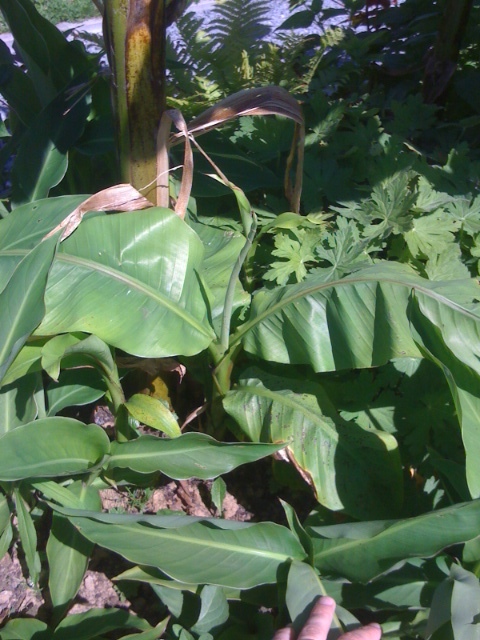 Hardy banana plants are becoming more and more popular, but the hardiness only counts for the corms! Under the 5 ° C the banana plant will not grow. At -2 ° C the leaves will be lost. Of course, a banana plant also needs water. Lots of water even! Certainly during hot summer days. A big subject can easily evaporate 10L of water on warm days. Please provide as much water as possible but do not leave the plant roots permanently in water to prevent root rot. During the winter months the water supply must be drastically screwed back. Banana plants can grow very fast. Especially when they get enough fertilizers. Too much is virtually impossible. In principle, all kinds of fertilizers will do. During the winter months the use of fertilizer isn’t needed. Certain (hardy) species can be planted well directly in the garden. During winter months, you will need to take the necessary precautions if you want to plant the plant to successfully survive the winter. In the garden the plant will grow faster than when cultivated in a container. Banana plants do not really nee to be pruned. However, for aesthetical reasons, you can prune the old-dried leaves. You can also remove pups regularly if you prefer an individual subject instead of a group of plants. When you cut the stem, by example when the plant has frost damage, the plant will start to grow again from this place in many cases. 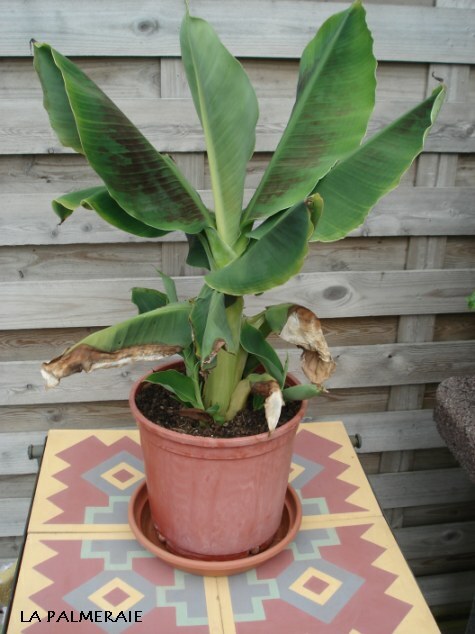 Basically, banana plants are not very prone to pests or diseases. Most of the problems occur during the winter months. The most common problems are spider mites, aphids or rotting due to wet soil. The first two pests are best treated as soon as possible with a suitable pest control. Rotting can only be prevented by providing a dry soil. The rotten parts are best cut away as soon as possible. 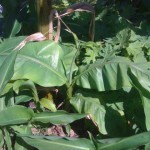 This article gives you an overview of the basic principles of banana plant care. Of course, care can vary slightly by species. Therefore, please inform yourself of the specific requirements or contact us.